Four years, three months, two weeks and a single day ago, I bought a case of wine. Yesterday I finished the final bottle. There’s something about the change in wine, its evolution and its ageing, that sets it apart from other comestibles. Everything else that you buy to put in your mouth is designed to be at its best when it leaves the shop. Except “ripen at home” pears. And they’re only ever with you for a couple of weeks, before you realised they’ve over-ripened at home and have to throw them out. Much wine is exactly the same, best consumed young and fresh. Some, though, alters and improves as the years go by, and this is one of them. At some point, inevitably, they stop improving and start getting worse. This is one of those, too. This bottle is certainly not the best I’ve had – to my tastes, it peaked about a year ago – but that’s perhaps the best way to say goodbye. It would be sad to polish off a case while suspecting that every bottle had been drunk too early. While it’s also a little sad to drink a wine too late, this one only cost me £7.50 a bottle, the kind of uplifting price that makes it easy to cope with being a little downcast. 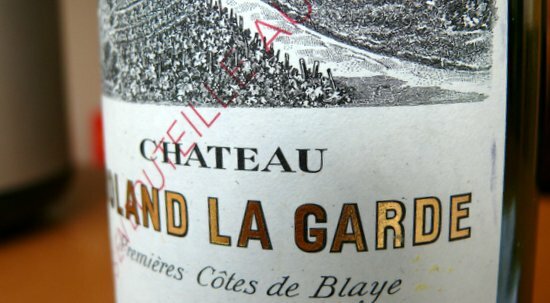 Chateau Roland La Garde, Premieres Cotes de Blaye 2005. Not a brilliant wine, but at its best an extremely enjoyable merlot-dominated blend from one of Bordeaux’s most unfashionable subzones, and always to be remembered as a significant marker on my personal wine path. This was the first wine I bought a full case of, a low-cost introduction to a different and less immediate kind of wine appreciation. There have been several more since, some whose progress I have only just started to chart and others stored elsewhere which I don’t even intend to introduce myself to for years yet. Somewhere, in some cases many miles from here, they are quietly sleeping, waiting. I can only hope that I choose something close to the right time to wake them up. I enjoyed the years Roland and I spent together, and look forward to achieving similar levels of intimacy with others in the future. What we shared was a very different and almost certainly superior kind of wine appreciation to that experienced when you pop to an offy, grab a bottle, take it home and drink it, however good that bottle is. But I remain bemused that an inability to properly enjoy a wine for years, sometimes decades, after purchase is seen as such a positive attribute; how customers managed to be convinced that being caused considerable hassle and expense was somehow to be welcomed. It seems like a rum old business to me.